Wednesday is Tour Day at EGA! | NJNA is Blogging! Wednesday is Tour Day at EGA! Tour day is one of my favorite days at seminar because I just love visiting new, interesting places. Our tour today had several stops. The first was at Cosanti Bells. Our tour guide, Jim, kept saying that we were going to Arcosanti after Cosanti Bells. And even when we got to Taliesin West he called it Arcosanti again. Arcosanti and Cosanti Bells ARE related, but our tour did NOT include Arcosanti, which is closer to Sedona. 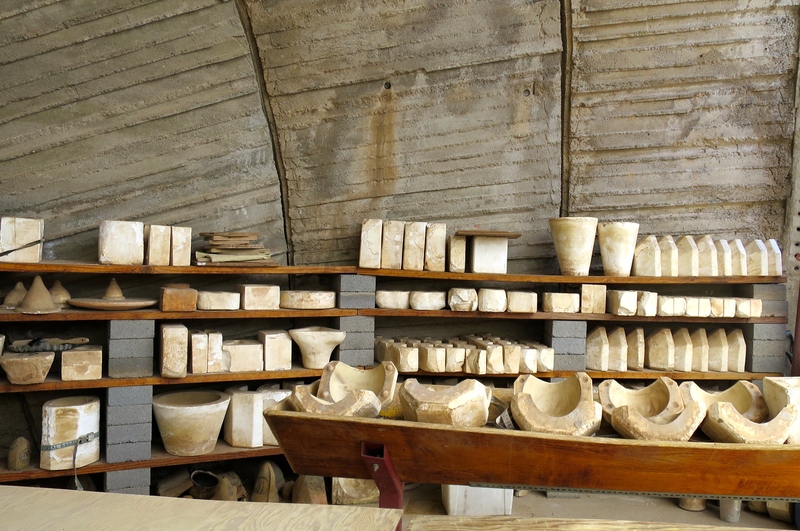 Arcosanti is an experimental city that was designed to be self-sufficient. The Cosanti Bells stop was mostly a shopping stop so that we could buy bells. I walked around the site and saw the molds which are used to make the bells. There was no commentary about the process, but I must say that the bells were beautiful and had a Southwest feel to them! Next we went to Frank Lloyd Wright’s “Camp” at Taliesin West. Wright built Taliesin during the depression when his third wife suggested that since he didn’t have any commissions that he should teach. 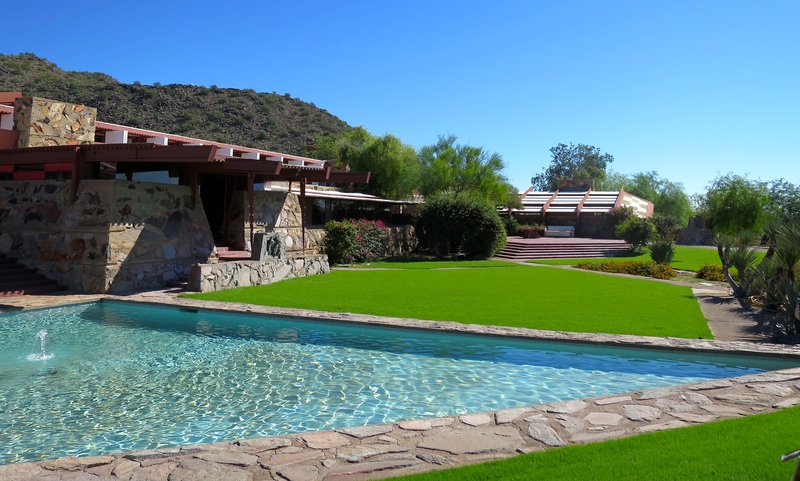 Taliesin West still functions as an accredited school for architects — during the winter months. During the summer, the students migrate to the original Taliesin in Wisconsin. The students must learn by doing — including building their own “tent/rooms” on cement slabs on the campus. “Taliesin” means shining brow. Wright believed that the architecture should fit into the environment and not overshadow it. Therefore, the structure sits below the top of the mountain and no structure is higher than the surrounding trees in this case the Palo Verde trees. We were lucky to have a wonderfully informed tour guide to take us through the Taliesin facility. We started with this petrograph that was found on site. 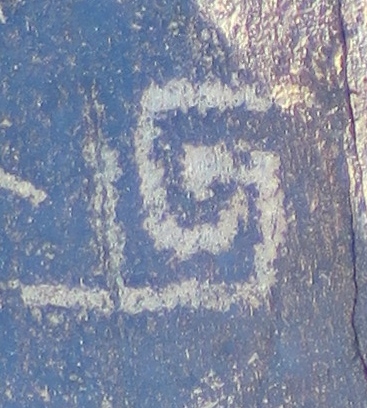 It was from this petrograph that the symbol/logo for Taliesin is derived. Taliesin Logo — Depicts Two Hands Clasping! On the left in the picture is the Taliesin West kitchen. If you are familiar with Wright’s history, he twice lost his home to fires that started in the kitchen. Here in the desert, he built the triangular pond so that he could form a “bucket brigade” in the event of another kitchen fire! Most of her sculptures only have about ten copies made before the mold is destroyed. 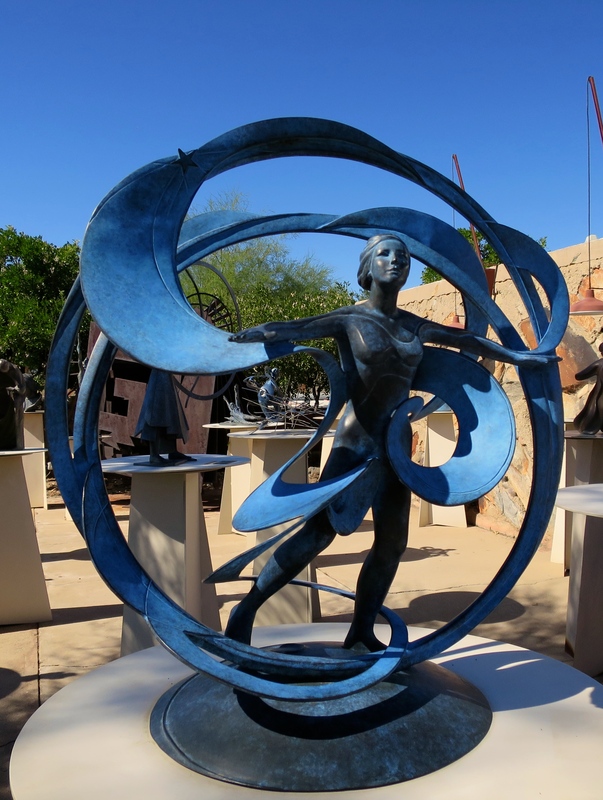 The base on which this (and her other) sculptures are displayed rotates so that you can view it from all sides! 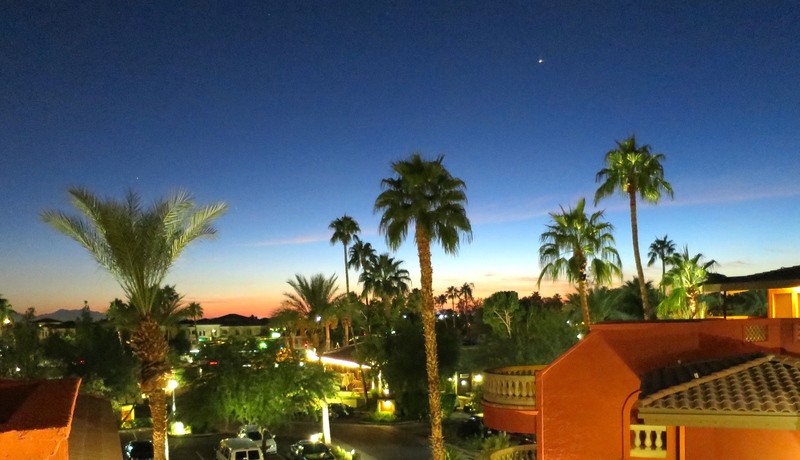 Finally — a lovely sunset from our hotel was a nice way to end our day! Tomorrow Sue and I both begin “Jasper” with Toni Gerdes.